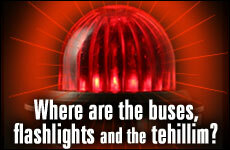 Where are the buses, flashlights and the Tehillim? We are losing hundreds of thousands of souls. Where is the outcry? Three years ago, I took a trip to Poland with Rav Noach Weinberg, zt”l, and sixty other Rabbis to see four concentration camps: Treblinka (the largest graveyard in the world), Auschwitz, Birkenau and Maidanek. I do not want to spend time here relating my feelings and impressions of that trip. Rather, I want to talk to you about Rav Noach Weinberg — about what he did over there and the legacy he left over there and then I want to tell you why I want to tell you. Constantly while we were in those camps, he expressed one theme again and again. Basically two words over and over again: me’oyvai techakmeni – may I learn from my enemies. Most of us spent four days over there crying. But he didn’t cry. He inspired. He inspired us to do kiruv rechokim: Look at what these monsters did. Take it in and take it to heart. And learn from them. They were meticulous. They kept records. When they heard that something wasn’t working, they changed plans to something else. They had a mission. They were motivated. They were dedicated to their cause. What about us? Are we like that? Are we as dedicated and serious about our mission as they were about theirs? Do we believe that one man can save six million Jews? He then began to quote some statistics that are very well known. We are losing over 100,000 Jewish souls a year to intermarriage and assimilation. In America alone, more than one and a half million Jews are practicing other religions. This is a holocaust. He brought it home to us. And some people say that perhaps this one is worse. The spiritual holocaust is worse than the physical one. We are losing millions. In the physical Holocaust, we lost six million kedoshim. In the current spiritual holocaust, we are losing millions of what? Kedoshim? They are notkedoshim. They are just lost many to other religions. Whenever I speak about this topic, I try to make it real to people. And it’s quite hard to do. We don’t see the barbed wire or the train tracks. We don’t see the gas chambers or the crematoria. All we see is nothing. People are disappearing and we don’t even see that. I once knew a baal teshuvah whose name was Shlomo Zalman Satanofsky, z”l, and he told me the following story. When he was becoming frum, still rather early on, he was traveling one Erev Shabbos and got stuck in Williamsburg. He knew at that point in his life that he could not drive on Shabbos, so he quickly parked the car and found a place to stay. The next day, he came to one of the Satmar shuls (in a green suit and purple tie) and began to daven. He happened to look up and saw three little chassidishe kids, with curly payos, looking at him very intently. Sound funny? But what about us? How many places do we know? Unless you are reading this from out of town, do you know many places outside of the five boroughs of New York City, Monsey, Lakewood and a few other New Jersey towns? We really do not see the horrible assimilation that is taking place right now. But it is happening. There really are hundreds of thousands of people that we are losing every year to assimilation. You wouldn’t believe it. You may not see it. But it’s true. I’m not making it up. What is our response to losing all these people? What is our response to the holocaust? My father had a landsman named Matis Friesel. A few years ago, my brother and I went to see him to connect with my father a little bit. We spent some time talking about our father. And then he said something startling to us. He said, “I came to this country after the war with nothing. No money, no family, I didn’t know anybody, gornisht. Nothing. And I know the number, but I won’t tell you what it is, I have between three and four hundred living descendents; children, grandchildren and great-grandchildren.” That was this man’s response to the Holocaust. That was his answer. There is a problem today that everyone talks about; it’s called kids at risk. It’s a very serious and difficult problem. But usually, there is one, perhaps two, children who need to be brought back from any one family. And we need to bring them back. Can you imagine going to some shopping center and, as you are looking through the scarves and sweaters, you see an old friend that you have not seen in thirty years. He moved out west somewhere and you lost track. So, of course, you begin to catch up, and he tells you about his family. Well, the oldest is a twenty-seven-year-old girl who went off to college and, from there, decided to spend some time in India in an ashram; and the second one, a boy, just came out of a rehab center, so he’s not doing too well and he has an undesirable friend, but we think it’s only going to be temporary; and the third is … and so on and so on. He goes down the line and all ten of his kids are off the derech or are “at risk.” Can you imagine? I have never heard a story like this baruch Hashem), but if I did, or if you did, I am sure we would walk out of that store utterly depressed; I hope we would. How much pain can this person endure? How can he get up in the morning and go shopping? What can I do for this guy? Does this sound outrageous? Think for a moment. What I just depicted is the family of theRibbono shel Olam. This is Hashem’s family. Try to make it real. Nine out of ten people are off the derech. They never said Modeh ani, never baked a challah, nor do they know about Shabbos. They don’t know about the Chofetz Chaim or how to make a brachah. Does this sound outrageous? This is the situation. I’m not making it up. Rav Noach used to say, “Do we feel the pain, kavayachol, of the Shechinah?” For our good friend, we would be losing our minds. What about the Shechinah? Remember Suri Feldman? More than ten years ago, she was a girl who went out with her high school class and got lost in the woods somewhere in Connecticut. Thousands of people pitched in to look for her. I am sure that there are people reading this article who were among those who went out to help. Out in the middle of the night people went. There were buses of people. Volunteers brought flashlights and provisions and people were saying Tehillim. And the world was watching us. They said, “Look at those Jews! One girl gets lost in the woods and they all mobilize to find her!” I remember where I was when they found her. I was driving in my car listening to WINS when I heard the news report. There was dancing in the streets. It wassimchah beyond belief. And of course that’s the way it should be. We should care that much for an individual. But let’s think about this for a second. Of course we had to save Suri Feldman. But here we have not one Suri Feldman, but millions of them. All of them lost. Where are we while this is going on? Where are the buses? The flashlights? The provisions? Where is the Tehillim? The around-the-clock worrying and crying? Where are we?! Why aren’t we mobilized?! How are we going to find them and bring them home? When Suri Feldman was lost in the woods we did not know what her situation was or how we could find her. But that didn’t stop us at all. For that chance that we could bring her back, we went out, en masse, to look. To find out where she was. I am willing to propose that everyone reading this article -even if you only know three places: Williamsburg, Monroe and Mitzrayim – knows secular Jews. They may not live on your block, but they are your cousins or second cousins. They are your accountants, doctors or lawyers. They are people that you meet on the bus, subway, airplane or the myriad other places we go during the day. They are often, sadly, the people that just pass us by (i.e., that we pass by) when we do not bother to look. You don’t have to go to Tucson or Vancouver to find them. These people are more than your cousins. They are your brothers and sisters. That’s what we constantly call them: Acheinu kol beis Yisrael. Where are the buses? The flashlights? The provisions? Where is the Tehillim? The around-the-clock crying? Of course there is some kiruv going on. Relative to how the baal teshuvah movement started in the ’70s, there is a lot of kiruv going on. But it’s not enough. We are losing the war on assimilation and intermarriage. So we spoke for a while that night. It was Motzoei Shabbos at eleven o’clock and twelve hours later (because if you don’t do something right away, it doesn’t get done) I was in an office on Coney Island Avenue studying material to be a lecturer for Discovery, and six weeks after that, I was on a plane to San Diego to give my first seminar. I am sure many of you have heard of Discovery, but many do not know just how successful the program is. More than 250,000 people have been to Discovery seminars around the world in some form, and a nice percentage of them become frum, or at least more Jewish. I would speak with Rav Noach Weinberg, who was always very happy that the program was in America. But then he would say, “Remember, Yaakov, we are failing.” I said “Huh?” He said, “Look at what’s happening! Of course every neshamah is important. Of course we are bringing hundreds and thousands and even tens of thousands back. But there are millions out there! Millions of people that are going to disappear from klal Yisrael! What are we going to do about them? We are failing.” So I asked him, “What should we do?” He said the only way to win, to really get out and reach our brothers and sisters, is to awaken the Sleeping Giant. I always thought that the Sleeping Giant was the great mass of unaffiliated Jews who barely know they are Jewish. But that’s not it. The Sleeping Giant is you! If you are reading this article, then you are the Sleeping Giant, because if you are affiliated enough to be reading this newspaper, you are affiliated enough to do kiruv. And the sad truth is that, statistically speaking, you probably are not doing it, because mostfrum Jews are not doing it. Yet, if you take a moment to do the math, that’s the only way this is really going to work. There are simply not enough kiruv professionals to reach all the Jews who are quickly assimilating. A recent estimate came to the conclusion that there are approximately 1,500 kiruv professionals in North America and approximately 4.5 million irreligious Jews in North America today. If thesekiruv professionals touched 10 people a year each in a significant way – reaching 15,000 people a year – it would take them 300 years to reach everyone. Clearly, by then, they will be gone! That’s why every frum Jew must help. There are approximately 500,000 religious Jews in North America, and if all of them reached out to just one person a year, we would have assimilation licked. Everybody can do something to make a difference. There are many baalei teshuvah today because a friend or neighbor did something small to reach out to them. If we all work together, we will be able to reach the millions. Yet it took some time to get frum baalei batim involved. It took time to get the people together, to raise the money and to get people interested. This movement of getting people together to get involved with outreach is called Project Inspire. When I would come to Eretz Yisrael and speak to Rav Noach, the first thing he would ask me is, how is Project Inspire? This was a man who accomplished so much for Klal Yisrael. You could fill a book of stories about what this one person did for the Jewish people. But all he wanted to know about was Project Inspire. Because he knew that the only real success in kiruv would come from normal people. Not the people doing Discovery, and not the people who work in campus kiruv and not the outreach professionals. Of course, all of these people are important to the process. They are at the forefront of today’s kiruv movement and we need them and we need more of them. But as a nation, our success or failure will depend n people like you. You have to get involved. I want to tell you a story that happened to me on an airplane once. I happened to be in the middle seat (I hate that seat but that’s for another article) and next to me is sitting a woman that I sized up very quickly. She was in her fifties, secularly Jewish, lives on Long Island, has 1.6 kids and wanted nothing to do with someone like me. To make a long story short, I managed to strike up a conversation. Not that it makes a difference but we spoke about Passover and how long the Seder is and how much grape juice she has to drink. It was a short flight and as we were nearing the end, I told her that I write books and that if she gave me her address, I would gladly send her an autographed copy of my latest book. She got very excited and gladly gave me her address, and when I got home, I immediately sent her an autographed copy of my book (What the Angel Taught You, which I co-authored with Rav Noach Weinberg, zt”l). And you’ll never guess what happened in the end. Ready? What happened is that I never heard from her again. I failed. There are hundreds and thousands of stories that I could have put into an article about doingkiruv, but I picked this one for a very important reason. When I told this story to my Rabbi, Rav Hillel David, he told me, “Yankel, I want you to know something. In that story, you were 100% successful.” But I failed! I hope you enjoyed reading this article. I hope that it was entertaining and informative (not in that order!). But of course, that’s not the point here. The point is action. The point is making it real. The point is to make this article practical for everyone who reads it. How? Simple. Start off slow. This week, do one act of kiruv. But do it. Invite that not-yet-frumneighbor, coworker or acquaintance over for Shabbos. Or call him and go out for lunch. Or call him and just say hello. Or send him an email with a link to an interesting article about Israel or one of the seven annual Yamim Tovim (Aish.com is an excellent source for articles and short videos). Next week, do another small act of kiruv and see what happens. The trick is to be consistent; do it once a week. “Well,” you say, “I’d like to, but I’ve known this guy for twenty years and haven’t done it yet; how can I start now?” Great! That’s what doing teshuvah is all about. Yesterday, I was doing something I should not have been doing or I was not doing something that I should have been doing. Today, I am going to change. Today, I am going to reach out. Project Inspire has many ways to assist people that would like to get involved in kiruv. One powerful initiative is kiruv training. If your community is interested and you can organize a few shuls or get fifty people together, we will send someone to give a three-part kiruv training seminar. We demonstrate kiruv techniques and show you what to say (we also show you what not to say – very important). We can give you the knowledge and the tools to do the kiruv. To literally bring back the Ribbono Shel Olam’s family. These seminars are happening or have happened in many communities. For a large enough group, we may even be willing to travel out of town. If it’s too hard to get such a large group together, then we have another program called HomeKiruv Training. Get just ten people together and we will send an instructor to your home to give a three-part class (men and woman separate; note that this option is not yet available in out-of-town locations). How much easier can it get? For more information on Project Inspire and Kiruv Training Seminars, send an email to info@projectinspire.com or call 646-291-6191, extension 201. Please reference this article. Whatever you decide to do, do it today. We no longer have the luxury of time to waste. This entry was posted in The Mitzvah of Kiruv, WHY me?